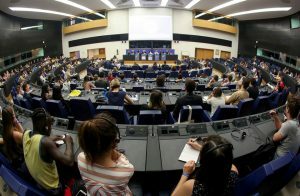 The European Youth Event is organised every second year in Strasbourg by the European Parliament to engage young people in the processes of the European Union. This year, ALL DIGITAL’s Board member Nenja Wolbers was invited to be an idea giver in the session “Forever Young: Survive me if you can”. 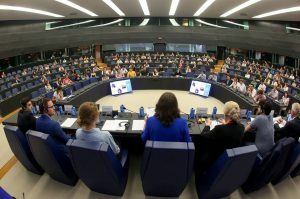 The European Youth Event 2018 (#EYE2018) took place on 1-2 June, and more than 8,000 young people between 16 and 30 came to Strasbourg to participate in an extensive programme with workshops, plenary sessions and other innovative formats. Nenja’s session had the format called Ideas Check, in which three young idea givers formulated each two ideas that responded to topics that they were given beforehand. 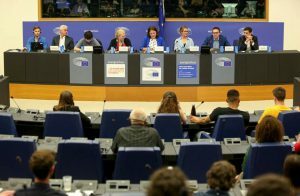 The ideas were received and answered by three MEPs: Anna Záborská, Brando Benifei, and Heinz K. Becker. Afterwards, the audience was invited to present ideas or ask the panel questions. Many young people took the chance to debate the presented topics with the idea givers and catchers and state their opinions, ideas, but also worries. In der Kürze liegt die Würze (or keep it simple, stupid): the ideas were not only simultaneously translated into French, German and English, but the idea givers had also only two minutes to present. Nenja’s first proposal for the EU was to invest more in adult education and specifically in the promotion of digital skills so that all generations can benefit from technological advances. 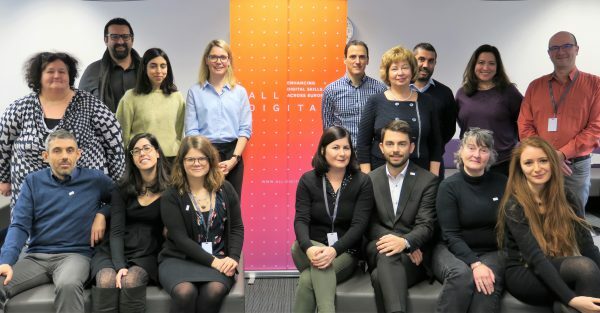 With the identification and qualification of multipliers in various positions throughout society, the training of employees, seniors and other adults in digital matters could become more systematic. Secondly, people live now longer but that doesn´t mean they also live healthier. This combination may have negative effects on the whole society. Therefore, Nenja proposed to use technology to give incentives for a healthier lifestyle. An app would inform and monitor people’s eating and working out habits and would then propose an incentive, e.g. to reduce taxes or give away free sport courses and cooking lessons. Other ideas of the session were related to the labour market and how work can be structured differently by implementing an intergenerational mentoring charter or promote the fairness between the generations.